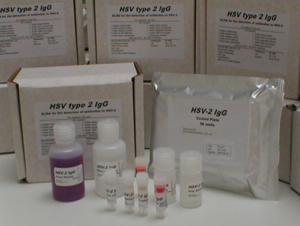 An enzyme immunoassay specific for IgG antibodies to type 2 Herpes simplex virus in human serum. For research use only, not intended for diagnostic use. Sufficient materials to test up to 92 test specimens. Contains one microwell plate and sufficient reagents to test up to 92 test specimens. The 96-well microwell plate comprises 8-well strips giving flexibility in the assay size.